There are so many Chocolate Cupcake recipes out there…but these are seriously the BEST Chocolate Cupcakes I’ve ever tasted. 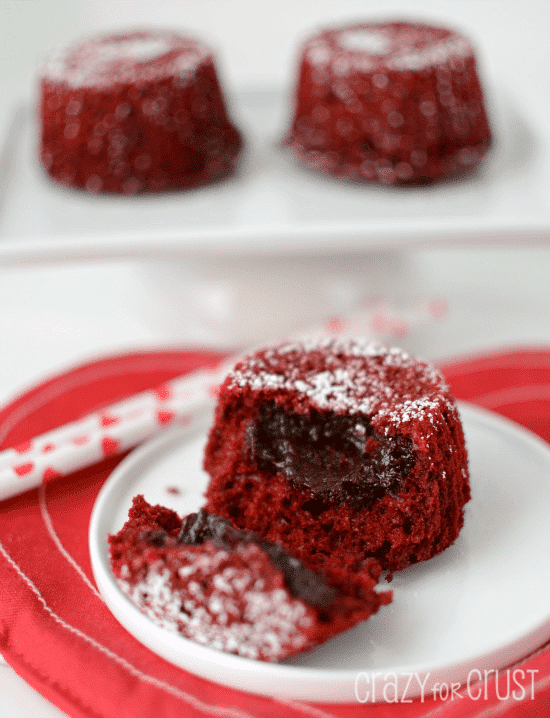 The frosting will knock your socks off…so be prepared! I am SUPER picky when it comes to chocolate cake and cupcakes. I never choose chocolate over vanilla…unless these cupcakes are on the menu. Then I pick chocolate every time. “Prices” seem inconsequential. If it’s on the internet and you use a credit card, that means it’s fake money you’re spending. I can add something to my cart and remove it ten times and a sales lady will not look at me like she wants to kill me. I can pretend I look gorgeous in the skirt/bathing suit/shoes/dress because the model is gorgeous in it. And, duh. It’ll look the same on me because it looks amazing on her. I can shop at 6am when I should be responding to email and making breakfast. I can pay attention to what I’m doing because I don’t have a little person saying “Mom. Mom. Mom. MOM!” in my ear. Internet shopping reminds me of these chocolate cupcakes: there are approximately 27 bajillion chocolate cupcake recipes on the internet. Everyone has their favorite. But OMG people. THIS recipe? 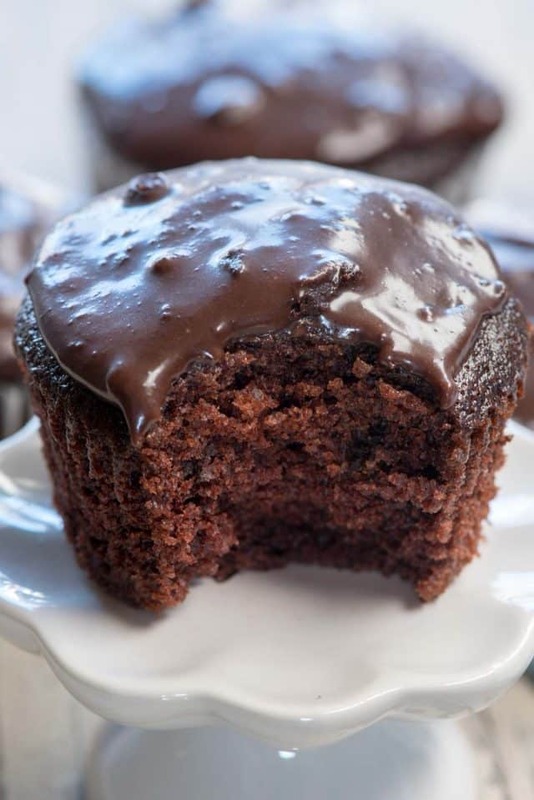 I love chocolate cupcakes…sort of. Normally I’ll pick vanilla every time. I don’t know why, I love chocolate. Just not always in cake and cupcakes. 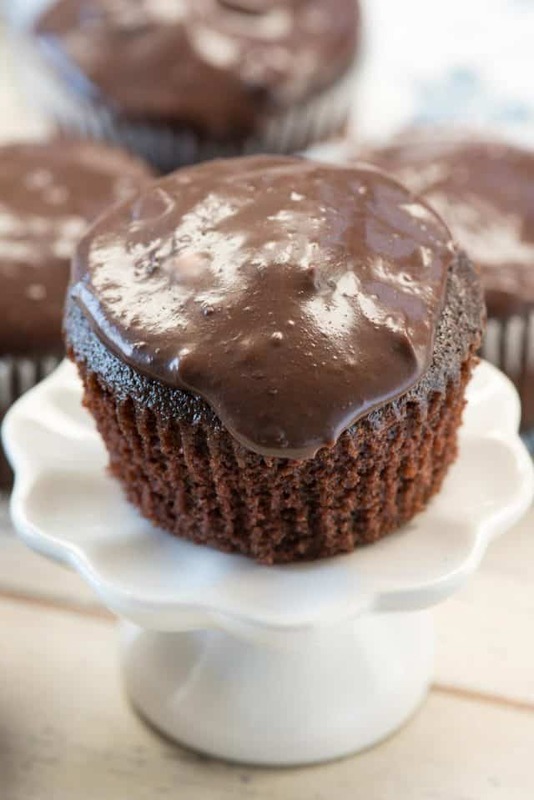 I find that chocolate cupcakes are rarely flavorful or moist enough for my liking….until I came upon this recipe. This is the ONLY chocolate cupcake recipe I ever make now, and it makes a pretty good cake too. The thing is, the cupcakes themselves are great but the start of this recipe is the FROSTING. It’s a cooked chocolate frosting that’s like a ganache but so much better. Let’s just say I have frosting left over. And I’m eating it with a spoon. It’s unbelievably rich and good you won’t be able to stop eating it. You’ll have to force yourself to actually frost the cupcakes with it. 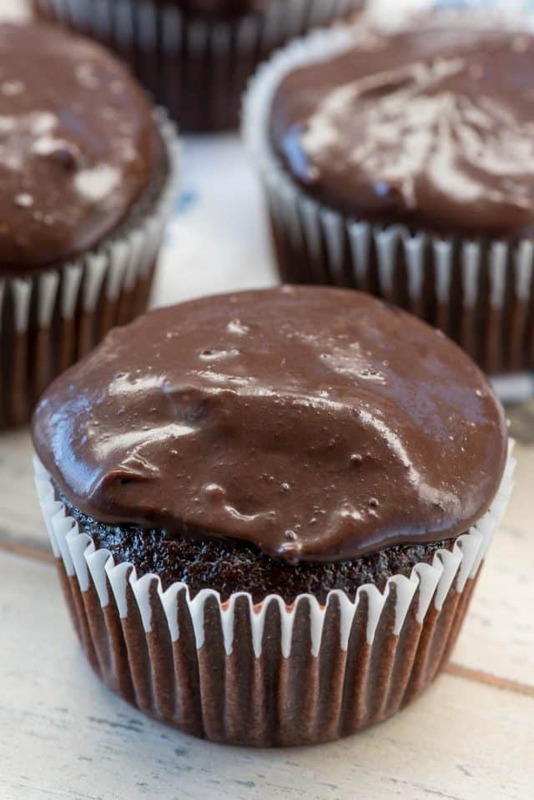 This is the Best Chocolate Cupcake Recipe you’ll ever make. The frosting is the best chocolate frosting recipe too! I think the thing I love most about this cupcake recipe is how soft they are. How you make cupcakes moist is always a question I get, and with this recipe it’s an easy answer: use oil. I always find that oil produces such a softer and more tender cake recipe. As an added bonus, the cake recipe itself has no eggs or dairy. The leavening is done with baking soda and vinegar. The reaction between the two, as well as the use of oil, makes the most tender crumb. Instead of milk, these cupcakes use hot boiling water as the liquid component. I’ve always asked myself why do chocolate cupcake recipes use hot water instead of milk? According to the ktchn, hot water is used to bloom the cocoa. When you add hot water to the cocoa mixture it releases the flavor particles in the cocoa producing an even richer and more intense chocolate flavor. More chocolate > less, don’t you think? This is such an easy chocolate cupcake recipe from scratch; you’ll never ask how to make chocolate cupcakes again! As if the chocolate cupcakes weren’t good enough, the chocolate frosting on top is probably the best I’ve eaten too. It’s gooey and super chocolatey. If you’ve never tried cooking your frosting, you must. It’s even better than a chocolate ganache on top of these amazing cupcakes. Be sure to use heavy whipping cream, as called for in the recipe. Be sure to cook it the for at least the 4 minutes specified. You want all the sugar dissolved. Plan for time: the frosting needs time to set. It takes a few ours in the fridge. This frosting isn’t thick enough for piping and it’s best on the cupcakes or pouring on a sheet cake. A layer cake might fall due to the thinness of the frosting. This is the last chocolate cupcake recipe you’ll ever make and I hope you enjoy! The richest, most decadent chocolate cupcakes ever! You'll never make another chocolate frosting again once you've had these. Preheat oven to 350°F. Line cupcake pans with liners (about 30). Whisk flour, sugar, cocoa, baking soda, and salt in a large mixing bowl. Combine water, oil, vinegar, instant coffee, and vanilla in a large mixing cup. Whisk to combine, then add to the dry ingredients and whisk just until the batter comes together. A few lumps are okay. Fill cupcake liners about 2/3 full and bake for about 12-15 minutes. (Mine baked in 14 minutes.) Cool completely before frosting. Melt the butter in a large saucepan over medium heat. Stir in sugar, cocoa, and salt. The mixture will be thick and grainy. Whisk heavy cream, sour cream, and instant coffee in a large measuring cup. Slowly add the cream mixture into your saucepan and whisk until smooth. Cook over medium-low heat until the sugar has dissolved and is hot to the touch, between 4-8 minutes. (Mine cooked in about 4 minutes, but it could take longer.) Do not boil! Transfer frosting to a bowl and let cool 2-3 hours until it’s spreadable. You can also chill it so it will set up faster. If it gets to hard to spread, microwave it on 20 second intervals, stirring in between, until it’s the desired consistency. Frost top of cupcake with chocolate frosting. Store in refrigerator, let come to room temperature before serving. first, i want to say that your page is awesome. I made the lemon cupcakes for new years eve and they were a smash. My grandmother used to make a chocolate sheet cake with frosting that looks just like yours. The minute I saw your picture, i knew it was the same and then i saw your ingredients and knew for sure. I love this recipe so much and my grandmother passed away and fore some reason, i never got her recipe. She did not have it written down, it was in her head. I was actually thinking about it last night and thought if anyone would have this it would be you. I am going to make them for a party this weekend and will let you know what everyone thought about them. As a child, i would start with a sliver of a piece and before i know it, i would be half way through the sheet, with a cup of coffee of course. I am so excited and great full. Completely worth the time. I was really skeptical about midway through the frosting recipe because I thought there was NO WAY it would come out smooth. The butter, sugar, cocoa combo is very thick. But as soon as I began combining the cream mixture, it all came together. I’m so impressed with this recipe. It took about 3 hours for my frosting to cool enough to thicken, but it was worth the time. So so good! I’ll be using the frosting recipe for more bakes in the future!